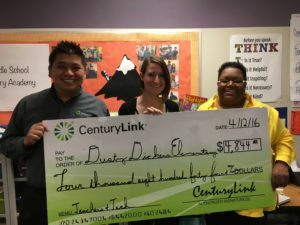 Last year, I was super fortunate to receive $5,000 from the CenturyLink Teachers and Technology Program. I now have a Chromebook for every student in my class that they use 40 minutes per day for an adaptive reading program and Google Classroom. Having one-to-one devices has completely revolutionized what I am able to do in my blended learning classroom. Education grant writing is too often misunderstood. I think it’s because we hear about full-time job openings dedicated exclusively to grant writing and assume it is too hard or takes too long. But those jobs are for huge sums of money that come with all kinds of strings attached that have to be monitored. There are grants that are super accessible to teachers and are worth a couple days of work. If you have ever considered writing a grant, here are four tips to help get you started and take away some of the anxiety. Pilot your project — I think one of the main reasons I received the grant is because I had already tested out my idea of a station rotation model for a few months with the little resources I had. People are more likely to give you lots of money if you have a proven track record of doing what you say you want to do. It doesn’t have to be perfect. Just an MVP, or minimum viable product. Can you say what has worked and why? Where are the pain points and how will the resources you are asking for alleviate some of that pain. Start with a compelling story or line — Just like we teach our students, the first line of any piece of writing matters. The selection team will have to pore over thousands of entries and many applications will start in a very robotic and uninteresting way. Don’t let yours be one of them. I will admit to having an edge in this area as a former newspaper reporter. However, I’ve counseled many people applying for jobs on how to start their cover letter with an interesting anecdote to illustrate their skillset, and they all got the job. Think about what will make people care and lead with that. It can be a startling statistic, a specific story that represents the problem you are trying to solve, or a bold statement about the current state of education. Carve out time to write on a break — I wrote my application over winter break. It was a quiet time when I could really reflect on my objectives and clearly state how I would put these resources to work. Be specific about your goals and make sure to address every question they ask on the application.